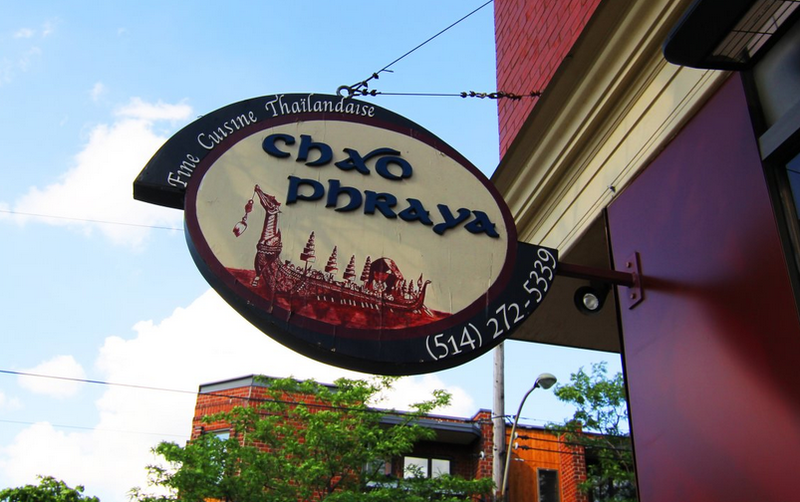 Chao Phraya – Authentic (but pricey) Thai cuisine – Montreal restaurant | Everything Delicious. Thai food is the best, I don’t think many people would argue with that! It’s balanced, delicate, & flavorful but also really varied so you never get bored of it…If I had to choose one type of cuisine to eat for the rest of my life, it would probably have to be Thai food. Thanks to cooking classes I enjoyed while traveling in Thailand, my cooking skills are pretty good, but sometimes, thai cravings just take me by surprise. And when that happens, I need to satisfy my burning desire & fast. No time for cooking! Quick, quick, a good thai restaurant! Unfortunately it’s not that easy to find a good thai restaurant in Montreal. When I lived in Toronto, I used to go to Khao San Road (truly authentic Thai food) but in Montreal I don’t have my go-to place yet. So, desperate to find one, I ventured to Chao Phraya. It was a weeknight and the place was empty but hey, I had a Thai craving so I went in anyways! 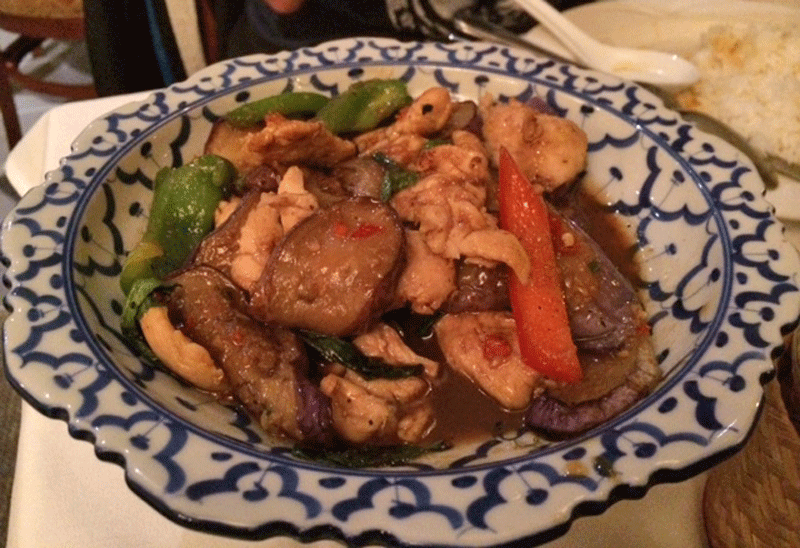 I ordered a dish of sauteed chicken with eggplants and basil, along with sticky rice. I’ve never had that in Thailand so I am not sure how traditional it is, but it was great anyways. The smell, the presentation and the taste, everything was perfect! My boyfriend lived in Thailand and has a soft spot for Panang curries so he couldn’t resist ordering one. This is one of the mildest thai curry, so always a good option when you don’t want something too spicy. The curry was delicious and apparently comparable to the ones you can get in Thailand! That’s A+. Although it has an elegant Thai decor, the place feels a little bit old fashioned. It was also very quiet, but again, we were there on a weekday so it may be more animated on weekend nights… The upside of having no one there is that we had the server to ourselves so it was quick. It’s a shame because the food was great….Well, I guess I will have to keep looking for my go-to thai place in Montreal. If you have any suggestions, let me know! 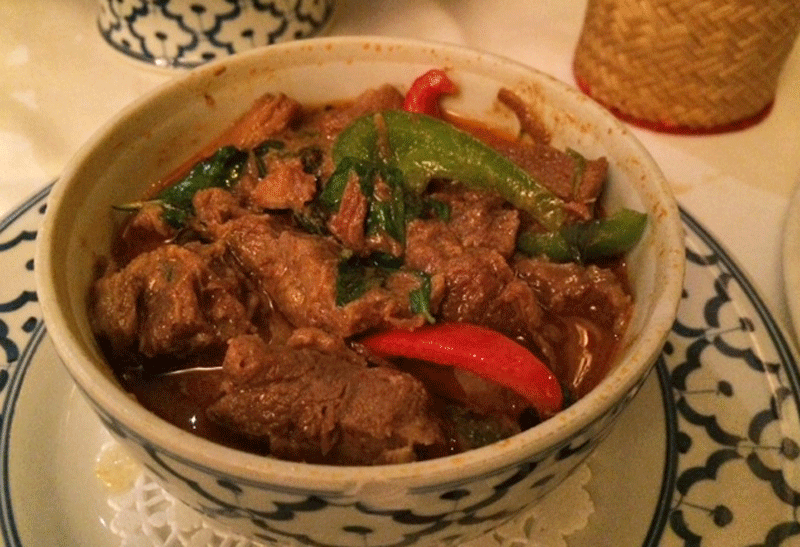 This entry was posted on January 12, 2015 by Pauline Rosen in Restaurant feed and tagged authentic thai food, chao phraya, curry, montreal restaurant, panang, restaurant montreal, singha, thai, Thai food, tom kha gai.